Congrats to Caryn and Sherry! 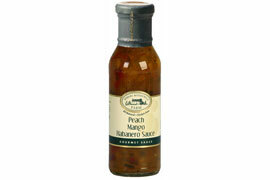 Peach Habanero Mango Sauce:A blend of sweet peaches and mangos, with the savory heat of habanero peppers. •Baste a variety of meats, poultry and seafood. •Mix with cream cheese and serve with crackers for an outstanding appetizer. What we thought: This was super tasty on grilled chicken. It added a sweet and spicy flavor that was super yummy. The kiddos thought it was a bit too spicy, but the adults all raved over the delicious meat. We also mixed a little with cream cheese and it made for a fantastic snack with crackers:) This sauce was a really great way to kick it up a notch in the kitchen with hardly any work on my part:) ABCD Diaries gives the Peach Habanero Mango Sauce from Robert Rothschild Farm an A+! Win It: Robert Rothschild Farm has generously offered two ABCD Diaries readers a jar of Peach Habanero Mango Sauce each! To enter, follow our blog via GFC and tell us how you'd use your sauce. (I would use it on chicken) And I entered Mediterranean Snacks. I follow you on gfc and I would use it on chicken! I'd use the sauce in one of my awesome salads! GFC follower and I'd use it to flavor chicken. I'd use it to marinate chicken and serve it over rice. I'd use it as a dip and on grilled chicken. I would use it on chicken. I'd eat with grilled chicken kabobs over rice. I follow on GFC. I love chicken so I would certainly use it on a chicken recipe. I follow you in GFC and I would use it on chicken. I follow via GFC and I'd love to make the Peach Mango & Habanero Glazed Ham. Follow via GFC as Caryn S. I'd marinate salmon in it and then bake it. follow via GFC and I think it'd be fantastic with pork. i am now a follower of this blog!! i would love to use this as a glaze for chicken! I love hot & sweet sauce and it's my favourite topping for grilled chicken! Also entered the Frito-Lay Giveaway! I would use this on grilled chicken! i follow use it in curry ty. I'd use the sauce on chicken. I entered the Harpari giveaway. I tweeted about this giveaway on Twitter at https://twitter.com/#!/likwan/status/106237179730210816.